Not Star Trek. What we’re talking about here is DNA sequencing, and the impact it is having, and will have, on studies of polyadenylation. Since last summer, there has been a spate of papers describing the application of so-called Next Generation DNA sequencing (in its many manifestations) to the matter of polyadenylation. The general idea is simple – to generate and analyze large numbers of short DNA tags that are derived from the junctions of the poly(A) tail and bodies of mRNAs. The expected outcomes of such studies are qualitative and quantitative descriptions of the genome-wide distributions of polyadenylation sites. This information would help to better annotate (or describe) the genome, and to help identify unusual occurrences. The latter might include alternative poly(A) sites, sites associated with as-yet unidentified transcripts, and sites that define antisense RNAs. I’ll (very) briefly summarize four studies that have been published since last July, focusing on the different approaches to making and sequencing DNA tags that query poly(A) sites. I hope to say more in later essays about some of the findings that these studies yield. But one thing that I find interesting and important is that, even though the experimental strategies differ, the general findings are fairly consistent. The first study was co-authored by 23 persons affiliated with 11 institutions. (For brevity’s sake, I won’t list the authors or institutions; readers are welcome to visit the publication’s web page and get the information for themselves.) This paper, entitled “The Landscape of C. Elegans 3’UTRs”, took a multifaceted approach to identifying poly(A) sites. This included the preparation and sequencing of full-length cDNAs from worms at different developmental stages, the “mining” of sites from the sequence traces that may be found at NCBI, by high-throughput 3’-RACE (involving more than 7000 different genes! ), by mining extant RNA-Seq data, and, most pertinent to this essay, by producing cDNA fragments that query poly(A)-mRNA junctions and sequencing these cDNA fragments using 454 pyrosequencing technology. Figure 1. Sketch of the tag prep used in Mangone et al. 1. Reverse transcription using an anchored oligo-dT primer flanked with tag that allows for pyrosequencing (red line). (RNA is shown as a thin line and gray letters; DNA is shown with a thick line or black letters.) 2. Second strand synthesis. 3. 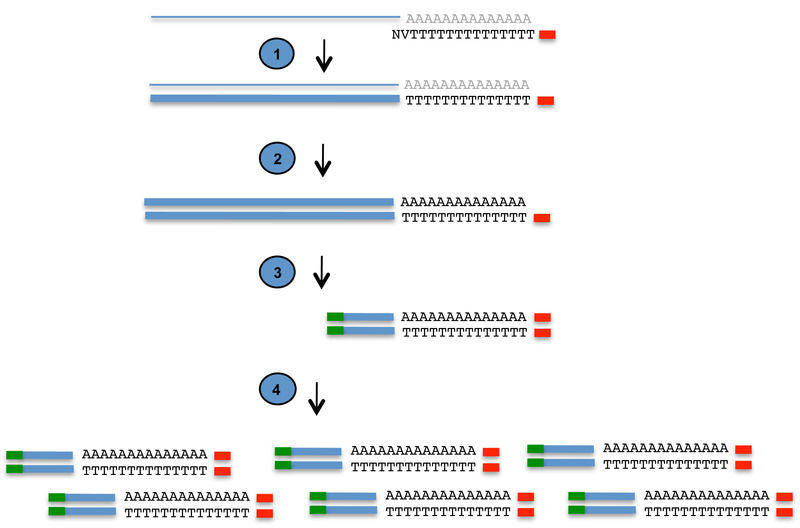 Restriction enzyme digestion and ligation of a second pyrosequencing-compatible tag (green line) to the overhang generated by the restriction enzyme digestion. 4. Amplification, purification, and sequencing. The second study (Ozsolak et al.) to discuss took a somewhat different approach to producing large numbers of sequences that query poly(A) sites. 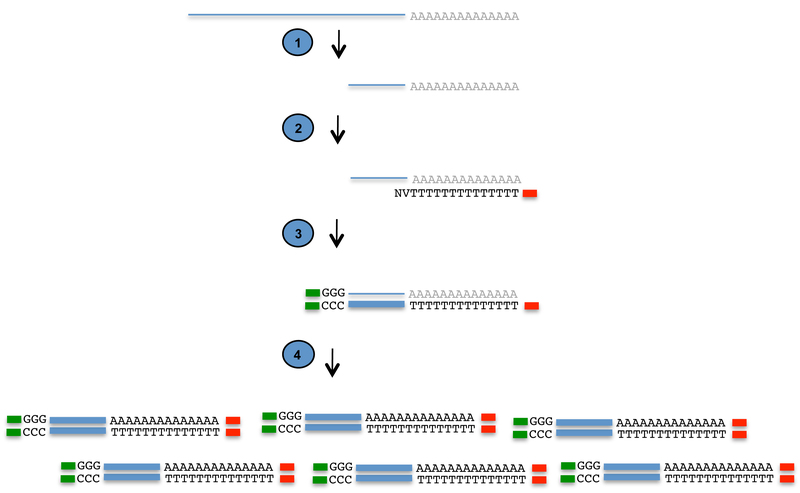 These authors utilized so-called Helicos sequencing technology and capitalized on the fact that the desired targets for sequencing – polyadenylated RNAs – are “natural” substrates for the sequencing method. (Other nucleic acid molecules need to be polyadenylated prior to capture with immobilized oligo-dT.) They used this method to sequence the 3’ ends of human liver and brain mRNAs as well as yeast mRNAs. Figure 2. Sketch of the tag prep used in Ozsolak et al. 1. Anneal poly(A) RNA to immobilized oligo-dT. (The immobile matrix is shown as a blue line.) 2. Fill in unpaired “A’s”. 3. Sequence using Helicos technology. The third study (Jan et al.) took yet another approach to generate sequences that define the mRNA-poly(A) junction. The two-tiered strategy involved an initial capture of polyadenylated RNAs using immobilized oligo-dT followed by a series of steps intended to permit reverse transcription and subsequent amplification of DNA tags, but without using oligo-dT for the reverse transcription. (The concern obviously is that oligo-dT may prime internally and not just within poly(A) tails.) The DNA fragments so generated were sequenced using Illumina sequencing technology. This technology was applied to the characterization of poly(A) sites in C. elegans. The fourth study (Shepard et al.) implemented a rather simple and clever method to produce and sequence DNA tags that query the mRNA-poly(A) junction. This group fragmented RNA and performed reverse transcription reactions using and anchored oligo-dT primer that had, at its 5’ end, sequences compatible with Illumina sequencing. They also incorporated a sort of “cap-capture” or SMART step, in which strand-switching was capitalized upon to place the opposing Illumina adapter at the other end of the DNA tags. Thus, a one-step RT reaction followed by PCR amplification and work-up sufficed to generate DNA tags for sequencing. 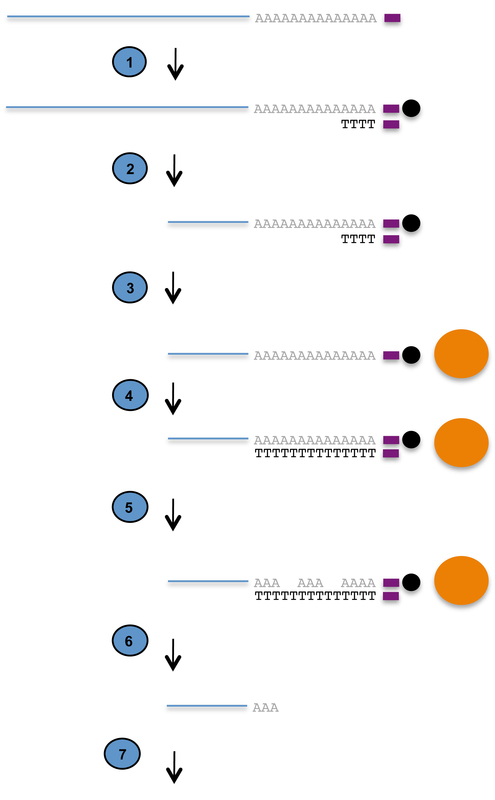 This method was applied to human and mouse mRNA preparations and the resulting sequences analyzed. Figure 4. Sketch of the tag prep used in Shepard et al. 1. Fragment RNA. 2, 3. 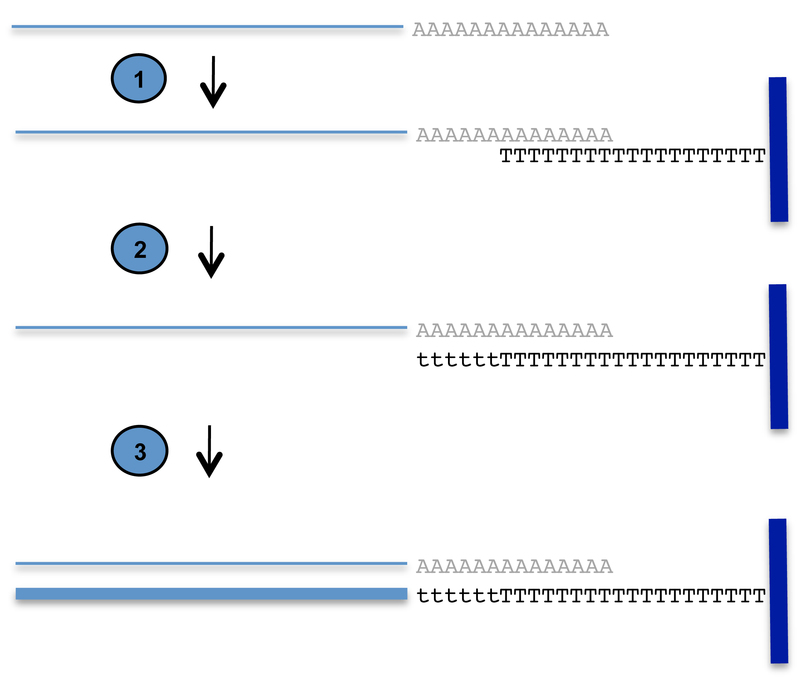 Reverse transcription using an anchored oligo-dT primer flanked with tag that allows for Illumina sequencing (red line). Include a primer (green tag) that has the opposing Illumina-compatible sequence (green line), along with a short oligo-dT tract. The latter feature is intended to take advantage of the propensity of MMLV reverse transcriptases to add short oligo-dC tracts at the ends of full-length cDNAs. When the oligo-dG tract anneals with the oligo-dC, strand switching by RT can occur, thus adding the “green” tag to the very end of the cDNA (as shown). 4. Amplification, purification, and sequencing. Without getting too lost in the numerous details, this group of studies brings into sharper focus several interesting aspects of polyadenylation. Regardless of the organism, it is apparent from these studies that many genes (ranging from 30-70%, the latter figure for yeast) possess more than one polyadenylation site, suggesting important roles for alternative polyadenylation in gene expression. Previously-noted developmental trends in poly(A) site choice are confirmed in these studies. There are strong suggestions of somewhat different classes of polyadenylation signal in C. elegans and mammals. A possible interplay between poly(A) site choice and microRNA targeting (such as is discussed here and here) is suggested by these studies. There is much more to be gleaned from this group of papers than I am inclined to discuss in this brief essay. Beyond this, there is great potential in this approach in studying various and sundry aspects of polyadenylation. We shall see what the future holds in this regard. Mangone M, Manoharan AP, Thierry-Mieg D, Thierry-Mieg J, Han T, Mackowiak SD, Mis E, Zegar C, Gutwein MR, Khivansara V, Attie O, Chen K, Salehi-Ashtiani K, Vidal M, Harkins TT, Bouffard P, Suzuki Y, Sugano S, Kohara Y, Rajewsky N, Piano F, Gunsalus KC, Kim JK. The landscape of C. elegans 3’UTRs. Science. 2010 Jul 23;329(5990):432-5. Ozsolak F, Kapranov P, Foissac S, Kim SW, Fishilevich E, Monaghan AP, John B, Milos PM. Comprehensive polyadenylation site maps in yeast and human reveal pervasive alternative polyadenylation. Cell. 2010 Dec 10;143(6):1018-29. Jan CH, Friedman RC, Ruby JG, Bartel DP. Formation, regulation and evolution of Caenorhabditis elegans 3’UTRs. Nature. 2011 Jan 6;469(7328):97-101. Epub 2010 Nov 17. This entry was posted on Monday, February 28th, 2011 at 11:35 pm and is filed under Polyadenylation. You can follow any responses to this entry through the RSS 2.0 feed. You can leave a response, or trackback from your own site. 13 Responses to The Next Generation? First (and relevant): These techniques are looking at transcripts so they would also catch noncanonical 3′ end processed transcripts as well – yes? Second – off topic but almost as important… your bracket – do you have UK meeting OSU in the third round? If so, are you picking the Wildcats. And if yes, is there any chance for a little wager? For the relevant question, the answer is yes, as long as the RNAs have poly(A) tails. One of the challenges and promises for experiments like this is sorting out the various mechanisms for 3′ end formation. For the other important question, yes, I expect UK to be playing OSU next weekend. But they better wake up – the revenge game against WVU won’t be much of one if the freshmen don’t show up. We’ll see about that wager Sunday night. Well the stage is set. Wildcats and Buckeyes. Shall we propose terms? Um, in light of the nail-biter against GMU, can I have some points? Say, 20??? We’ll have to find a time when one of us is in the vicinity of the other (for example, this year’s Rust Belt Meeting, or whatever we’re going to call it, is supposed to be in Dayton) and the (sore) loser can pick up the tab at a respectable dive, er, establishment. Or maybe the loser pays the “attendance” fee for this meeting. Well, in light of the Bucks last showing I suppose I could be at least a little generous. Twenty seems too generous though… as the Cats do seem to match up well, and the season being on the line… I think I can give 10 points. The Astrobiology meeting looks like something to see. Need to finish reading about it. Wow!… nice effort. And not a fluke. Congratulations and good luck the rest of the way. Thanks, Clem. Undoubtedly your well wishes helped out today against the Tar Heels. Sorry UK couldn’t get past UCONN last night. It was very close, but somehow a relatively quiet game until the end. Well, I didn’t toss myself off a bridge. The championship game was hard to take, knowing that the title was there for the taking on Sat. The week has been a sports bummer in the Hunt household. Saturday was bad, and it was followed by a 1-7 start to the season by the Red Sox. Character building. Has to be.